Is First Solar shining bright, or is the sun setting on this industry leader? 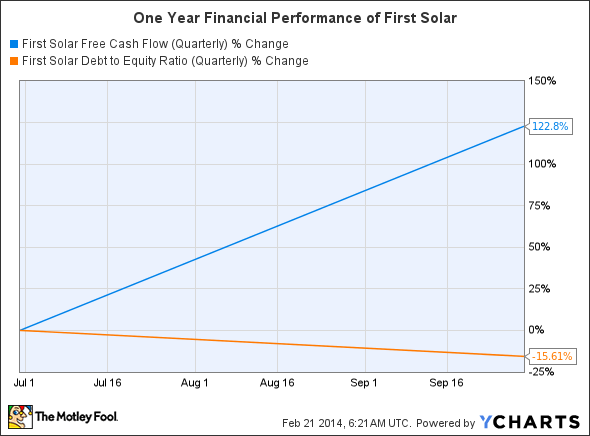 First Solar (NASDAQ:FSLR) , an industry leader in the production of photovoltaic, or PV, modules and the development of utility-scale solar projects, is set to report earnings next week. Here are some things to focus on in the release. Recently, First Solar made news when the U.S. Department of the Interior selected the company for 550 MW of project development on the California-Nevada border. First Solar will be selling the generated electricity to Southern California Edison in the form of a 20-year power purchase agreement. Booking projects is essential to the company's success. For the third quarter, First Solar booked 860 MW of new business while shipping 406 MW, equaling a book-to-bill ratio over two-to-one -- impressive when, according to NPD Solarbuzz, the last time the PV industry recorded a book-to-bill ratio over one was in Q1 2011. For Q4, look to see if First Solar has managed to make progress on the 7.7 GW of potential booking opportunities that it noted during the Q3 release and maintains a book-to-bill ratio over one. During the Q3 earnings call, management referenced several projects that were expected to begin construction during the fourth quarter or early in 2014. One of the these, Moapa, is a 250 MW project located in Nevada that is under a 25 year power purchase agreement, or PPA, with the Los Angeles Department of Water and Power. A recently completed project, which may prove to be the harbinger of more opportunities in an emerging solar market, is the 13 MW solar PV power plant in Dubai in the United Arab Emirates. The first phase of the Mohammed bin Rashid Al Maktoum Solar Park, the facility is the largest of its kind in the region. First Solar isn't the only company looking to establish a presence in the region. SunEdison (NASDAQOTH:SUNEQ) is working closely with Saudi Arabia to build a vertically integrated solar PV facility in the country. At a cost of approximately $6.4 billion, the project would begin construction in 2017 with an annual capacity of 3 GW. Saudi Arabia has a goal of 6 GW by 2020. Not too long ago, the solar industry recognized First Solar as a global leader in thin-film manufacturing. Last April, though, the company announced its acquisition of TetraSun, a high-efficiency silicon solar start-up. Offering customers a crystalline silicon module affords First Solar the opportunity to get into the residential market -- a market in which it has had no exposure, instead operating only in the utility-scale space. According to the company, production of the TetraSun modules is supposed to start in the second half of 2014. Look for any insight as to how on-target the company is with meeting this goal. Successful production and marketing of these modules could be a great boon to the company, which believes that "With lower installation costs, faster installation times, and greater system revenues, our crystalline modules will deliver unparalleled value for our customers." Rooftop solar and distributed generation is considered by many to be the biggest domestic growth opportunity in solar. The silicon panels enables efficiencies over 21% -- one of the more efficient silicon panels on the market. It may even prove to be a threat to SunPower (NASDAQ:SPWR), which, on the most recent earnings call, said that it's aiming to develop X-series panels that are 23% efficient by 2015. According to GTM Research Senior Solar Analyst Shyam Mehta, "If the technology from TetraSun scales inexpensively, it puts First Solar far more at odds with SunPower than it is even now. And it opens up the high-growth third-party-ownership residential market as well." First Solar is entering a new arena, not only with technology, but also with services. Now, for the first time, the company is offering its operations and maintenance, or O&M, services to third-party companies. Since utility-scale solar facilities are often in 25-year PPAs, the offering of O&M services presents First Solar with the opportunity to develop new and sustained revenue streams. Again, look to see any insight into this new offering from the company. Is revenue being recognized already? If not, when does the company expect to start securing O&M contracts? As the company looks to develop the TetraSun modules and execute $300-$350 million in capital expenditures, it is important for the company to continue its impressive growth of free cash flow and successful management of debt (oftentimes the scourge of PV manufacturers). First Solar seems to be basking in the sun, but the reality may be starkly different. Next week's earnings call will provide plenty of insight into the company's performance, providing investors with more information upon which they can make a sound decision regarding investment.